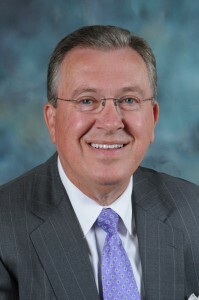 Dr. Rex M. Horne, Jr.
Dr. Rex Horne, who served as president of Ouachita Baptist University at Arkadelphia for nine years, became the president of Arkansas’ Independent Colleges & Universities in July 2015. Horne replaced Rex Nelson, who had served as the AICU president since January 2011. Nelson was named to the new position of director of corporate communications for Simmons First National Corp. Simmons, which is based at Pine Bluff, is a financial holding company with operations in Arkansas, Kansas, Missouri and Tennessee. Horne grew up at Camden. He completed his freshman year at Ouachita before finishing his bachelor’s degree at Arkansas College (now Lyon). He later earned a master of divinity degree from Southwestern Baptist Theological Seminary at Fort Worth and a doctor of ministry degree from New Orleans Baptist Theological Seminary. He was a weekly columnist for the Arkansas Democrat-Gazette for 10 years and is the author of three books. Under Horne’s leadership, Ouachita significantly enhanced and expanded campus facilities. AICU is governed by a board of trustees consisting of the 10 presidents of the member institutions and a group of more than 20 business and civic leaders from across the state. The organization’s executive director now carries the title of president.